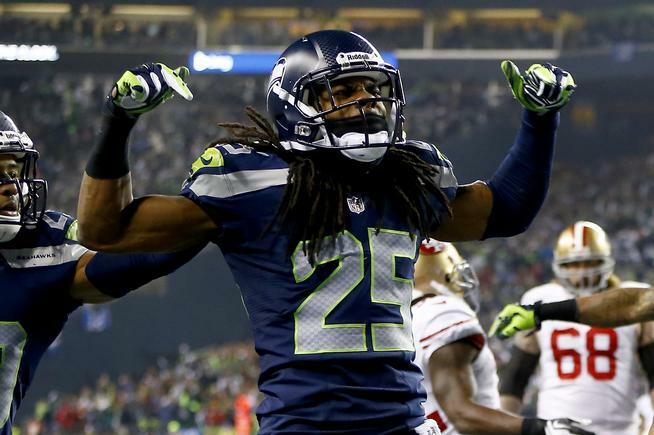 Someone somewhere coined the axiom “Big time players make big plays in big games.” No defensive play this year was bigger than the pass defensed by Richard Sherman that turned into the game ending interception to win the NFC Championship. It would have been easy to catch Sherman flat footed having played a majority of the game being avoided. If you make the biggest play in the history of your team to send them to the Super Bowl, you have done something. How many times do we see a player dominate in the regular season only to disappear in the playoffs?? Yet Sherman was front and center as one of the lead players on the #1 defense in football. In the most pivotal game of the season, Sherman provided the key play. Not the NFC Championship, but week 4 when the consensus was Seattle couldn’t win on the road. It was the 4th quarter when the Seahawks were losing in Houston 20-13. At the time the Texans were thought of as a Super Bowl team and on their way to a win. 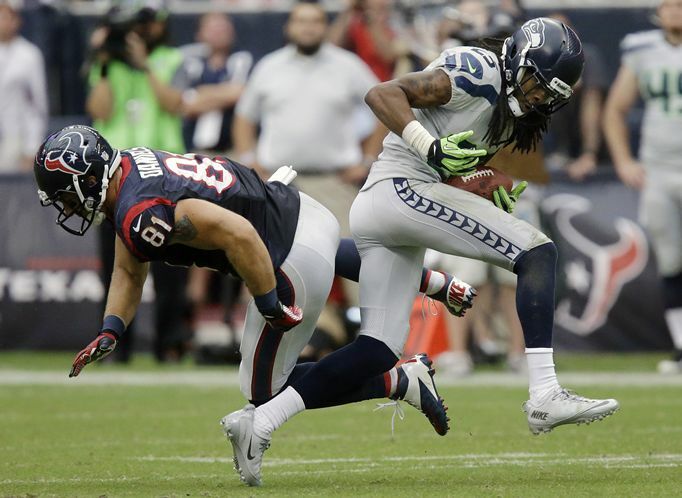 With just 2:51 left Sherman jumped a Matt Schaub pass and returned it 58 yards for the tying touchdown. Seattle eventually won 23-20 in overtime. The resultant confidence led the Seahawks to a 6-2 road record and NFC best 13-3 record. While the Texans didn’t win another game the rest of the season. Talk about a turning point. The big interception against Houston. In 2013, Sherman talked the talk while leading the NFL with 8 interceptions, returning them for 158 yards and that significant touchdown. He also was 7th on the team in tackles with 48, defensed 17 passes and recovered 2 fumbles. The Seahawks assign him to their opponents best receiver and he answered the bell every week. In the pivotal moment of the NFC Championship we saw a transcendent play. For an instant Colin Kaepernick thought he had Crabtree breaking free and let fly. From a fundamental standpoint he stayed inside Michael Crabtree, using the sideline as his friend, then reacted to make the play of the season. Navorro Bowman pictured in last year’s Super Bowl. 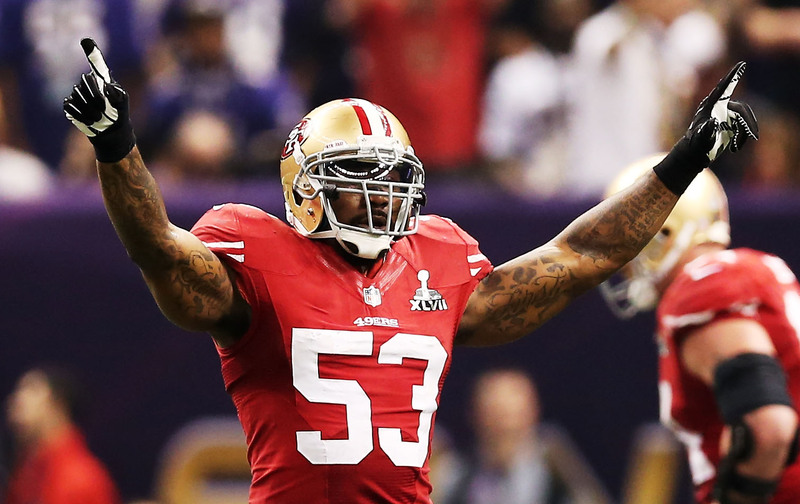 Navorro Bowman ILB – San Francisco 49ers: We were just a couple plays away from back to back Taylor Blitz Times Defensive Player Awards for Navorro Bowman. If Richard Sherman doesn’t turn in that play to win the NFC Championhip how does he not win it again?? As we made it to the second half of the season, many pundits were pitching the case for Luke Kuechly. However truth be told he didn’t turn anywhere near the season Bowman did out in San Francisco. On top of that, was there a bigger defensive play than the interception return for a touchdown to put San Francisco into the playoffs?? Monday night against the Falcons his 89 yard pick six takes place with 1:31 to go when the 49ers needed a play. This play and his final play are the essence of the man. He stops Kearse in the 4th quarter of the NFC Championship at the two yard line. The tackle wasn’t enough, he forces and recovers a fumble although he injures himself in the process. It’s that spirit that makes him the best linebacker in the NFL. One we wish a speedy recovery from the knee injury suffered against Seattle. Burfict has been the playmaker on Cincinnati’s top ranked defense. Vontaze Burfict ILB – Cincinnati Bengals: Another blood thirsty linebacker who turned in one stellar season was this former Arizona St. Sun Devil. He recorded an astounding 50 more tackles than his breakout rookie season with 177 total tackles. Add to that his 3 sacks, 8 passes defensed, an interception, 1 forced fumble to accompany 2 fumble recoveries with one returned for a touchdown. He was the trigger man on the NFL’s third best defense and has a great future ahead of him. We just need to see if he’ll be featured in the new defensive coodinator’s scheme now that Mike Zimmer is the head man in Minnesota. 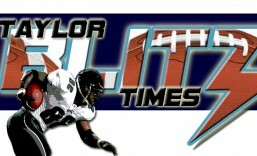 These were the defenders that made the season for Taylor Blitz Times. This entry was posted in 2013 Post Season and tagged Cincinnati Bengals, Defensive Player of the Year, football, Navorro Bowman, NFL, Richard Sherman, San Francisco 49ers, Seattle Seahawks, sports, Taylor Blitz Times Defensive Player of the Year, The National Football League, Vontaze Burfict. Bookmark the permalink. SHERMAN TALKS BIG,,HAD A BIG PLAY AGAINST SF,,LETS SEE HOW HE DO WITH THE BRONCOS WR CAUSE,,MANNING ISNT A JOKE. SF really missed Bowman on Seattle’s last go ahead drive. Between his playmaking ability and leadership that was a BIG blow. I agree….they didn’t play bad or anything but you miss a leader and playmaker. Could the defense have been a step slow after suffering his loss psychologically? ?